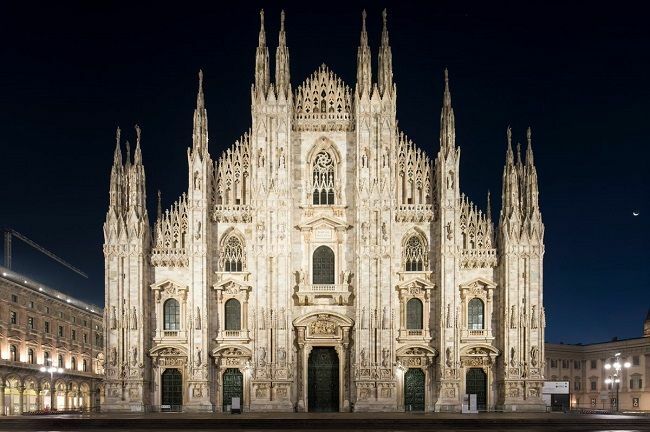 Since EXPO 2015, the interior of Milan Cathedral has radiated in majestic brilliance thanks to efficient LED lighting tools from ERCO. The entire exterior lighting of the world's largest marble building has now been upgraded to high-performance, durable ERCO LED projectors. Pietro Palladino from Ferrara Palladino Lightscape is responsible for planning of the prestigious project commissioned by the Veneranda Fabbrica del Duomo di Milano cathedral workshop. With the "ERCO individual" service, series products were transformed into individual lighting tools – adapted to the local requirements. Over 400 Lightscan spotlights with specially increased luminous flux illuminate the cathedral facade. Compact Gecko spotlights were used to accentuate the Gothic verticals, pinnacles and tower spires. The custom-produced "ERCO individual" versions of Lightscan and Gecko score with high lumen packages, a higher safety class, special mounting brackets and a housing colour precisely matched to the pink-grey marble of the facade.